Goulburn’s town square came alive on Saturday with international dance, music and food. The Goulburn Multicultural Festival has grown exponentially over 12 years. Photos: Maryann Weston. Twelve years ago Goulburn’s Multicultural Festival began with refugees wanting to give back to the community that welcomed them – around 30 people attended. But on Saturday (23 February), thousands attended a vibrant event in Belmore Park, breaking down stereotypes that rural Australia is less supportive of multiculturalism than the big cities. 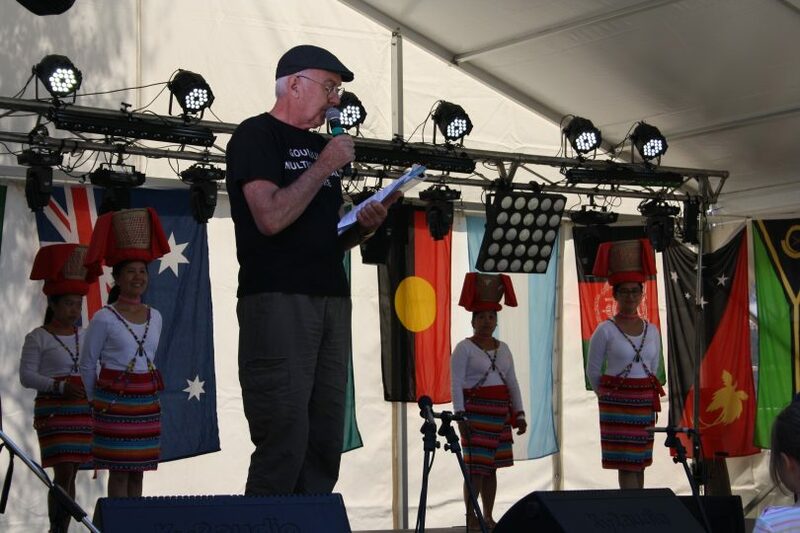 The festival has grown exponentially to offer the region a day that transcends borders, and provides a simple but powerful experience of culture, Goulburn Multicultural Centre Director and festival organization John Gunn said. “The festival started with a small group of refugees and new arrivals we were supporting who felt Goulburn was a welcoming place and wanted to engage with the broader community, to promote harmony and understanding and also to give back to Goulburn,” he said. Primarily the festival is a display of the dance, music, and food of cultures from across the globe. There is a full stage and ‘big sound’ for performances, food and market stalls. “It’s getting bigger and bigger each year,” John said. From Macedonian culture to Chinese, Indonesian, Filipino, Indian, Middle East and South American, the festival offers an up-close-and-personal experience on the weekend. Afterward, Goulburn’s premier youth festival, VibeFest, continued into the night. “We provide the stage and sound for VibeFest, so you have the multicultural festival from 10 am-4 pm and the youth festival from 5 pm-10 pm,” John said. Part of the attraction and the ‘vibe’ of the Goulburn Multicultural Festival is that it not only breaks down the stereotypes that rural Australia is less tolerant of other cultures than the bigger cities, but it also provides immigrants and asylum seekers the opportunity to celebrate and share their culture. “When the Filipino community celebrates they do it with music and style. They make their own costumes which are very sophisticated, for their dance. They have a lot of pride in their culture and for them, sharing this culture with others, and that it’s welcomed, makes them feel accepted as part of the community. Locals take in the dance performances on the mainstage. The festival is staged in partnership with Goulburn Mulwaree Council. 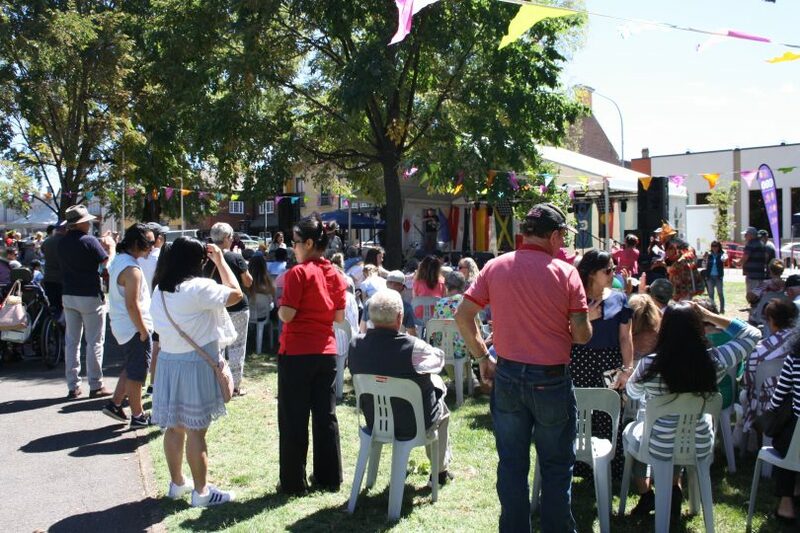 One of the aims with the 2019 festival was to create a ‘village square’ feel to the Belmore Park precinct with tables and chairs so festival goers could eat, browse the markets and watch the entertainment. Another was to include Celtic culture as well. “We are a nation of immigrants no matter where you come from. Even our Indigenous peoples traveled from country to country [within Australia] and there were over 500 dialects before colonization,” John said. A focus is on dance at the festival, and performers can range from seven years of age through to 80 years. Around 200 people performed on the day, showcasing the diversity of the Goulburn Mulwaree and the broader community. 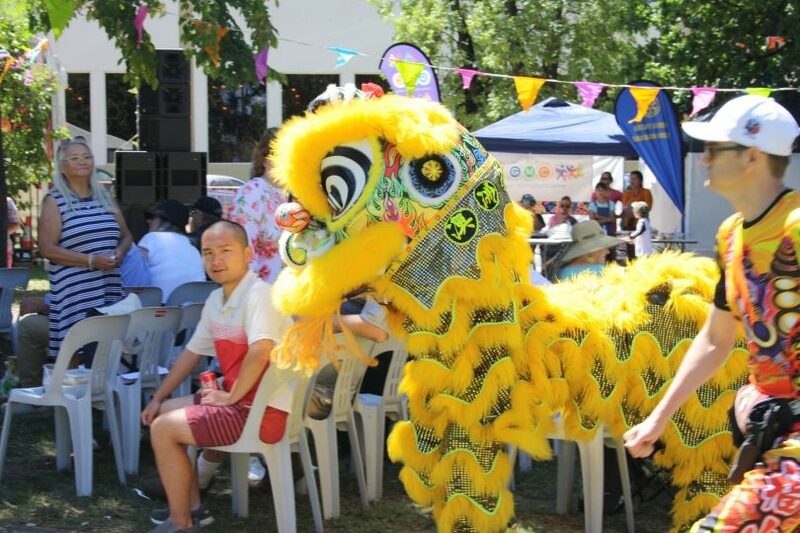 There were many highlights during the festival from the Goulburn Chinese Lion that was created for the festival, through to the displays of South American and Middle Eastern culture. You can stay up to date with Goulburn’s multicultural events here. Festival organiser John Gunn introduces Filipino dancers.